As the CEO of Dribbble, a global community and invite-only platform for designers to share and find work, Zack Onisko faces a unique challenge: how do you grow a gated product? Zack began his career as a product designer before moving into product management and then growth roles. Most notably he led growth strategy at Creative Market (a global marketplace for design content that was acquired by Autodesk) and Hired.com. He’s also a mentor at Reforge and 500 Labs. Dribbble was bootstrapped for nearly a decade before being acquired in early 2017, when Zack joined, and it was already profitable too. All the while, the product has remained invite-only and hasn’t required traditional marketing. Considering Zack’s background as a designer, I recently hosted him on our podcast to learn how growth and design are intertwined. We also cover why Dribbble has remained invite-only, how grassroots events have grown the Dribbble brand, and much more. If you enjoy the conversation, check out more episodes of our podcast. You can subscribe to it on iTunes, stream on Spotify or grab the RSS feed in your player of choice. Stewart Scott-Curran: Zack, welcome to Inside Intercom. To set things up, can you give us a quick overview of your career to date? What it was that led you to joining Dribbble as CEO? Zack Onisko: Thanks for having me. I’ve been with Dribbble now for about a year and a half. Previously I was at Hired.com and Creative Market before that. I also spent some time at Autodesk after the company acquired Creative Market. I have a long history of working in miscellaneous startups, either in the creative space or in the recruitment space. I’ve known Dribbble co-founders Dan Cederholm and Rich Thornett for many years, and Creative Market was a sponsor of Dribbble – we used to host South by Southwest parties together. When I heard there was a role open for CEO, I threw my hat in the ring, and here I am. Stewart: Thinking back to Dribbble in its earliest days, it was fundamentally a place for designers to post work in progress and get feedback. Over time it’s become more of a mixed platform. A lot of people are using Dribbble as their portfolio now, and it seems like you’ve embraced that by adding features like Playbook. What drove that change? 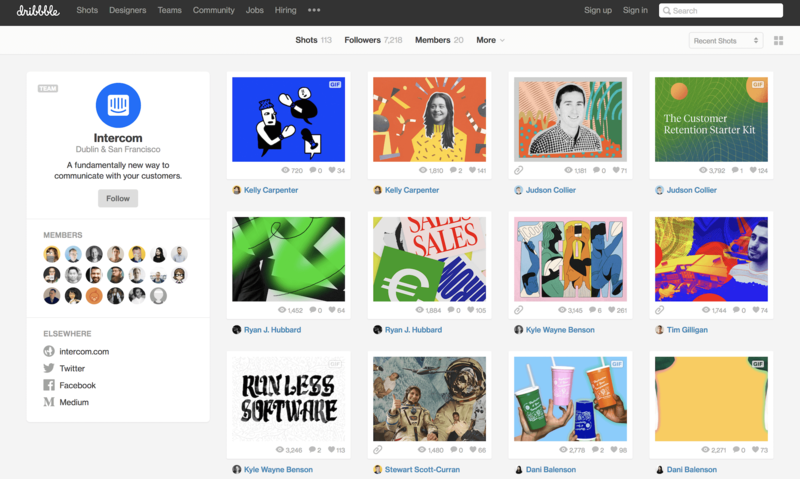 And on a broader level, how do you see the Dribbble community shaping the tool that you’re building, and vice versa, how does the tool shape the community itself? Zack: Dribbble has always been the place where you answer the question, “What are you working on?” Our co-founder Dan Cederholm recently said at a conference that some of his early shots were actually of random, non-design things, like “Hey, I’m making a Keynote file,” which wasn’t very cool. It was really the early community of folks that started taking those zoomed in shots of larger works in progress and creating a snapshot of this moment in time. Over the years, the community has evolved, and we’ve seen more folks posting polished and finished work and using Dribbble as their portfolio. In the past year, we’ve invested in mature analytics and built an intelligence team to aggregate data and trends towards business opportunities and things that we should be building. With that said, we still spend a lot of time talking to the Dribbble Community and asking them about their experience, the platform and how we can ultimately improve. One of the investments we’re making is carving out a proper user experience research function in our internal design team. We’re constantly listening to the community and really shaping Dribbble based on their feedback. 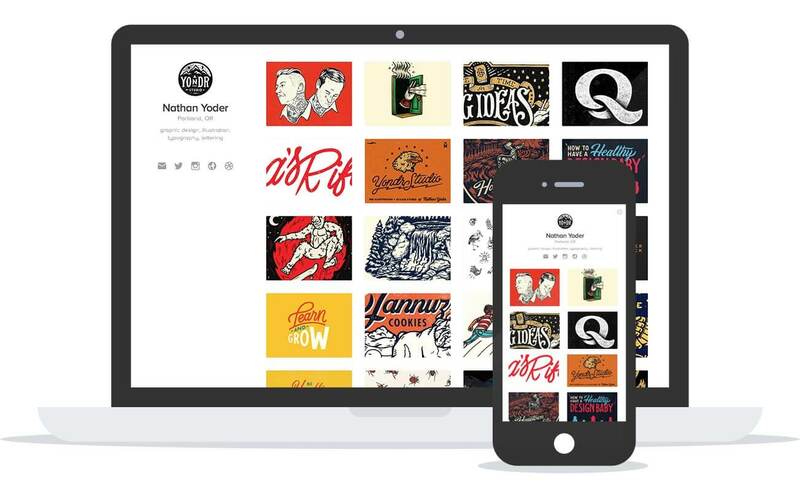 Dribbble’s Playbook feature was created in response to how users were naturally using the product. Stewart: The Dribbble community is quite passionate and vocal. The way they self organize their own meetups is evidence of that. How does your team think about and navigate change aversion when you’re introducing those new features or concepts? Zack: Human beings are naturally resistant to change, but one of the things I love about the design community is that people are super passionate, and for the most part very positive and supportive. The bigger releases usually have an associated shot from the Dribbble team or a blog post, and of course we read the comments. People are very vocal on Twitter too. We’re releasing small features and functionality changes almost daily, and while many are missed by the community, we get lots of feedback. Ultimately we have an amazing community team that manages our social and support channels, and reports feedback, bugs and other issues back the product team. We don’t always get it right, but we’re very sensitive to user sentiment and having conversations with folks to understand their perspective. Stewart: One of the most fascinating things about Dribbble to me is that it began as an invite-only platform, and now almost a decade later it’s still invite-only. A lot of companies take a gated approach like that in the early days, but then open it up as they begin to chase growth. Dribbble hasn’t done that. Can you could give us some insight into the thinking behind that strategy? The invite system was a means of controlling growth from happening too fast. Zack: In the early days, the invite system was a means of actually controlling growth from happening too fast. The team was just Dan and Rich for the first couple of years, and even at the beginning of 2017, we only had eight people on the team. Today we’re over 30, so we can afford to grow a little bit faster. We have hundreds of thousands of designers who are on our prospect waiting list, and we’d love to dip into them a little faster and be more inclusive. With that said, we don’t have plans to remove the invite system anytime soon. It’s become a part of Dribbble. We’ve begun to make improvements to the invite experience and are starting to experiment with how invites are allocated. For example, we’re giving more invites to folks who are more engaged on the platform. We’ve made improvements to the prospect experience as well. Now prospects can upload samples of their work, which are only viewable from the drafting page. That makes it much easier for players who have invites to find amazing designers and let them in. Eventually, I’d love to open up Dribbble and be more inclusive to everyone, but one day at a time. The other side of the coin is that while we’ve been invite-only, there are tons of invites in the ecosystem and a lot of designers who aren’t choosing to invite folks in. The effect is that we have a pretty high bar of quality, which is great. It’s kind of a give and take. Stewart: With such a selective user base, how do you think about monetization at Dribbble? Do you have to be more selective about how and when to charge for new features? Zack: We’re a community first, so it’s our job to continue to add value back to the community. That said, the community’s made up of different people and personas who come to Dribbble for different reasons, and these different personas have different needs that require different products. That informs our roadmap. Obviously we have a few different revenue streams sprinkled in, including subscriptions, advertising and hiring solutions. We’re ultimately on a mission to build the world’s best platform for designers and creative professionals to gain inspiration, feedback, education, community and ultimately job opportunities. But, we’re really about putting the community and mission first, and the business models kind of fall in place after hopefully we’ve done a good job delivering value to the community. Stewart: With that said, Dribbble is profitable, which is fantastic. But, you’ve never really done marketing in the traditional sense. A lot of the growth has been organic. What are the biggest levers for growth that you’ve been able to pull? Particularly when it’s a selective user base and not just anyone can sign up. Zack: It’s truly been organic and word of mouth to date. There’s never been a focus on marketing or growth. Just this year, we’ve started to build out a growth function internally, and that function is really looking at the community holistically. We’ve brought in SEO as a function, we’ve hired a PR agency to help us make the brand recognizable outside of just the Dribbble designsphere, and we’ve just started to thinking about content marketing. All these things are very much in their infancy, and we’re just kicking them off. Dribbble has been this organic side project of Dan’s and Rich’s that grew wings and spun out of control over the years. We feel really bullish that as we start to invest in SEO, content marketing and some of these other kind of traditional marketing tactics that it’s going to add fuel on the fire and help us get Dribbble to a much wider audience. Stewart: Thinking about this community first mentality, one of the most well known ways that Dribbble grows and extends its brand is through those community sponsored meetups. How much or little involvement does the team on your end have with those, and what’s the desired outcome there? Zack: We really have very little involvement. This was something we saw happening organically in the community. Designers were meeting up in person and grabbing beers and just talking shop. Since then we’ve developed a platform that allows folks to send reminders and RSVPs and be able to tap into the community to get folks out to meetups. But, with the exceptions of larger events, like something at South by Southwest or corporate meetups at Adobe’s or Dropbox’s headquarters, we’ve mostly stayed out of the way, other than being the platform to bring designers together in real life. 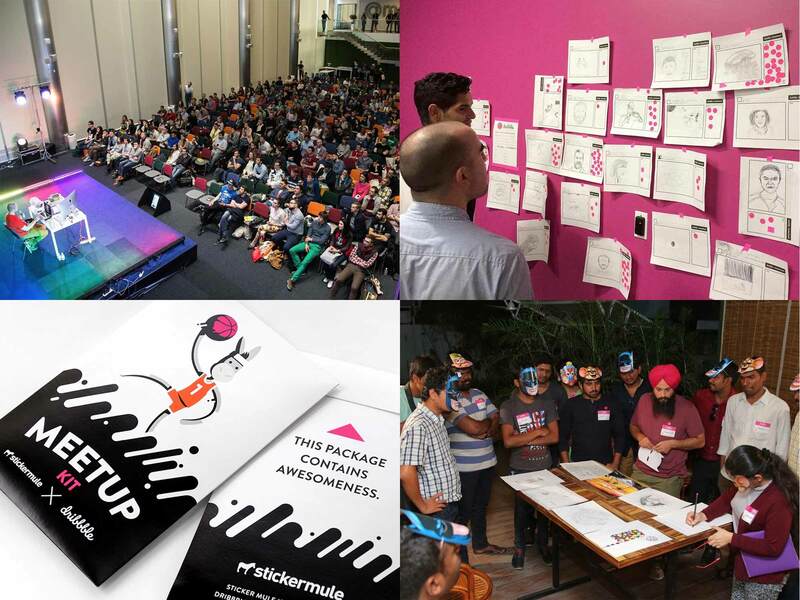 Thousands of designers attend Dribbble meetups each year. Today there are meetups all over the world, tens of thousands of designers meeting up in person. It’s really cool. We do have a person on the team who sends out meetup kits to the hosts. Those include Dribbble stickers, buttons, pencils, notepads, those sorts of things. For some of the bigger events, we up the swag and maybe we’ll work with sponsors to add prizes. Stewart: Interestingly you’ve also begun growing the Dribbble brand and experience through your own Hang Time events. How do those differ from the more grassroots and community level events, and what do you think you can accomplish with them that you can’t with the smaller, more locally organized events? Zack: Hang Time’s origin started with the growth of our internal team last year. We more than tripled the size of our team, and we’re remote. We’re distributed all over North America and the UK, and we decided we wanted to get the team together in person at least twice a year. Originally we thought we could just get people together and have an offsite. Then we thought about doing a happy hour meetup of our own and inviting the local community. That quickly evolved into doing a mini design conference. We could rent out a venue and invite amazing designers to come out, tell their story and teach workshops. Now, Hang Time is pretty different than a Dribbble meetup, which might be an hour or two after work at a bar or at somebody’s office. We’ve only done two of these now, or one, and we have another one coming up soon, but it’s a lot of planning. We’re doing a full day of lectures and talks. We’ll do food, drinks, sponsored booths, swag, prizes – it’s this whole thing. We did our first Hang Time in Boston last fall, sold out, and had a blast. We have another one coming up in May in Seattle and then we’ll be in Los Angeles in October. Stewart: Going back to the topic of growth, the company’s growing, the community’s growing, and you’re of the opinion that a lot of the thinking and frameworks that startups use for growth today are actually quite similar to the creative strategies that designers use. That sounds like a really interesting comparison. Can you expand on that? Zack: Ultimately building and growing products comes down to people. Design thinking at its core is about approaching product design from a human centric lens, and it’s the same thing with growth marketing. They’re very similar ideologies. Ultimately building and growing products comes down to people. The framework around design thinking is really about understanding the user problem, exploring ideas and prototyping. You materialize those ideas through user tests, and finally you launch your thing. But, any given time you go back and reiterate any of those steps in that framework. This is very similar to Eric Ries’ The Lean Startup framework. The difference is that he builds in code, then he measures through data and A/B testing to learn and come up with new ideas and rinse and repeat. So they’re two very similar frameworks for understanding a problem, testing that thing and then launching it and getting it in front of people. The difference is that with modern prototyping tools, like InVision, it’s much easier and faster than ever before to get a prototype in front of users. So typically when you test your design or mockup, it’s a really small sample size. If you’re getting feedback from a single user, it’s an opinion of one. Compare that to getting an aggregated signal from a multivariate test, where you understand what is happening, but not really the why. I believe that once designers can adopt both of these approaches, which are now being taught in Stanford Business School and other MBA programs, they’ll have a much more accurate understanding of users and a true understanding of the product problems they’re looking to solve. Stewart: As someone who’s a designer by trade, but who’s built, led, and ultimately sold startups, what aspects of your design days proved most valuable when you moved into a leadership role? Zack: My foundation in design has been tremendously valuable throughout my career. I started my career as a web designer and have a design degree, and then moved into product management and growth roles over the last 15 years. But in these PM and growth roles, I’ve continued to wireframe and create prototypes to quickly communicate product ideas to my team. The speed at which I can visualize in Photoshop and other design tools means that I can get these ideas in front of the product team much quicker than writing a brief and running the whole cycle. So being able to move much faster over the years has been an advantage, along with being somebody in a leadership role who can roll up his sleeves and get his hands dirty. When I look back at the biggest wins of my career, they’ve been product design solutions. Product managers and growth marketers have a tendency to try to solve problems convergently, by changing aspects about what is already there in the product. A lot of marketers fall into the trap of A/B testing copy or a photo, and then hoping for this dramatic lift to happen for whatever KPI they’re working on. The great way that designers solve problems is we tend to think divergently. Great designers have the ability to think outside constraints of what’s already there, scrap it, and come up with something completely new. They come up with a brand new direction or solution to solve the problem. Stewart: You mentioned earlier that the Dribbble team is entirely remote. The topic of remote versus in-house teams is an ongoing topic of conversation within the design community. What was the thinking behind the decision to be fully remote at Dribbble, and what are the pros and cons that you see with that approach? Zack: The team has been remote from day one, and I’m a firm believer in remote being the way that working on the internet should be. Our head of product is going to Bali this summer and will be working from the beach. It’s taken me 20 years to realize that we’re able to actually do this and have effective efficient teams working from anywhere in the world, but it’s taken the bandwidth to catch up. It’s taken time for our tools to catch up. Now we’re seeing 100% distributed teams grow to huge sizes in companies like Automattic, InVision and Buffer – teams that have proven the model can work well. We’re still small at 30 people, but in our team already we can see that we work much more efficiently remotely. I get so much more work done than when I was working in a corporate office. You’re free from distraction. I have no more commute, and I can start working at the beginning of the day when my brain is fresh and some of the best ideas are blossoming. We’re seeing distributed teams grow to huge sizes in companies like Automattic, InVision and Buffer. I also have a much more flexible schedule, which means more time with my kids and my family. That’s important for the entire Dribbble team. A lot of us have families and are involved in school and sports with our kids. Having that freedom and flexibility is not only super important, but is also looked at as a benefit and a perk to the rest of the team and it’s been amazing to recruit for. People want to work in this environment. Also, the distributed team helps save the company money. We don’t have to pay 3x to 10x the national average is to hire or rent office space in San Francisco or New York. On the con side, it’s not for everybody. We tend to look for self starters and motivated people. Some people are 5xers when they work from home and they work remotely. Other people get distracted by the sunshine, or the backyard, or the TV, so we try to screen those folks out. But for the most part, it’s been great. In the time that I’ve had at Dribbble, I think we’ve had one person leave, and it was more a mismatch in role than culture. Stewart: I saved the easiest question for last. What’s the biggest strategic challenge facing Dribbble moving forward right now and how are you aiming to solve for that? Zack: There’s not much keeping me up at night when it comes to worrying about strategy or challenges to the business. I’m very excited about the potential for Dribbble and all the great things that we can do to further support the design community and the profession. While we’ve been in business for nearly a decade, I feel like we’re very much in our infancy as a business. Last year we had some huge inflection points. We tripled the size of our internal team, but we also more than doubled our user base and more than doubled our annual revenue. We’re getting our momentum, and there’s wind in our sails, so stay tuned. Stewart: We’re big fans of the platform here at Intercom. Our design team has its own page and we always love posting on there and seeing what all the other teams are up to. Thanks for joining us, Zack. Zack: Thank you for having me!